When Daniel Arenas was in high school in South Carolina, his undocumented immigration status made everything uncertain. Without qualifying for federal financial aid or in-state tuition, could he pay for college? After college, would he be able to work legally? So, although he had grown up in the United States, he applied to college in Mexico, where he was born. He was admitted to the prestigious Monterrey Institute of Technology. Now, as the founder of an organization called Dream in Mexico, he helps other so-called Dreamers — people who immigrated to the United States without documentation as children — resettle in Mexico. Arenas spoke last week as part of the panel Return Migration: The Untold Stories — one in a three-part series of programs in April sponsored by the UndocuAllies Initiative, a student organization at the Harvard Graduate School Education. The group formed in 2017 to educate the Harvard community (and beyond) about challenges facing undocumented immigrants. As Arenas recounted in Askwith Hall last week, his focus, initially, was on people like him, gifted students who were trying to figure out a path to college and fulfilling careers. But now, he works with young people who are returning to Mexico for all sorts of reasons, including deportation, and he’s sharing guidance on everything from navigating Mexican higher education to overcoming social challenges to helping grandparents get a tourist visa to the United States so they can see family who moved away decades ago. For Ed.M. candidate and UndocuAllies co-president Ariana Aparicio Aguilar, the uncertainty that Arenas felt as a high school student was familiar. Before DACA, she faced the same crippling uncertainties. Like Arenas, she came to the United States from Mexico as a young child. But, unlike him, she chose to attend college near where she grew up, in Northern California. When she graduated from Sonoma State University in 2011, she faced limited prospects, despite a strong academic track record. “I didn’t want to face my reality of having to work under the table and put my degree on display but not be able to use it,” she recalls. Everything changed on June 15, 2012, when the Obama administration announced DACA. 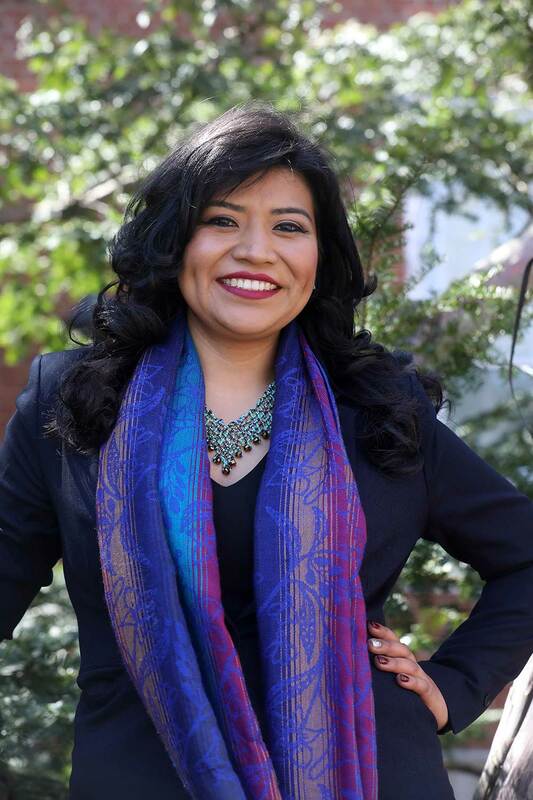 Aguilar was able to work legally for the same nonprofit organization that had helped her apply to college, before taking a job at her alma mater, where she worked as an academic advisor and helped launch a resource center for undocumented students. She chose Harvard for her graduate program because of Professor Roberto Gonzales and his research on undocumented immigrants. Before the school year even started, she began her work as a diversity and inclusion intern focused on UndocuAllies for the Office of Student Affairs. By September, along with student-activists from across the university, she was meeting with incoming Harvard president Lawrence Bacow to talk about immigration issues. Her internship was a new position, added to expand on the success of the student group from the previous year. Aguilar did more with the position than anyone could have dreamed, said Tracie Jones, the associate director of student affairs and equity and inclusion and Aguilar’s supervisor. Aguilar spearheaded workshops on how to support undocumented youth, planned events, and worked with administrators across Harvard and at other Boston-area universities. “I only have nine months, so I don’t have time to waste, and I do want to make a difference,” she says. Aguilar, who is in the Higher Education Program, eventually hopes to be a college president, because — as she’s learned through her work at both Sonoma State and Harvard — universities need to undergo serious changes to properly support and advocate for students from traditionally underrepresented populations, including undocumented students. “There’s a lot more recognition and a lot more interest in supporting this student population,” than there was when she was in college, she says. But more needs to be done to create a sense of belonging for undocumented students, as well as to advocate for them and their families in the policy sphere. An important part of the work of UndocuAllies this year is to deepen the conversation around the undocumented immigrant community, taking it to less-expected places, and focusing on personal story. That’s apparent in the name of the three-part series, Immigration Narratives of Self-Reliance, and Solidarity, which Aguilar helped organize. And UndocuAllies also wants to develop policy approaches — new ways to push for comprehensive immigration reform that encompasses entire families, rather than just children — that go beyond DACA access. “Oftentimes we think of ‘undocumented’ as being only a Latino issue, and it’s not,” Aguilar said. The series has highlighted the diversity contained within the “undocumented” label. The first event was called “Undocumented and Black: Race and Justice in America,” featuring immigration activist Denea Joseph, Harvard professor Cornel West, and Harvard immigration attorney Jason Corral. Aguilar had first connected with West when she took his course on American democracy. The final event in the series, on April 8, will feature a talk by Jin Park, a Harvard College alumnus who is the first undocumented immigrant to receive a Rhodes Scholarship. The Trump administration has stopped granting deferred action to new applicants, and current DACA recipients are in limbo, too, unsure of the future of the program. They’re no longer able to apply for “advanced parole,” which allowed them to travel outside the country, which means that if Park attends Oxford, it’s uncertain whether he’ll be able to reenter the United States. Colleges and universities have to be at the forefront when it comes to solving these conundrums for their students, Aguilar says. And they need to think bigger than DACA and its protections — especially since, at the moment, no one new can apply. Panelists at last week’s event — where Arenas was joined by Gonzales, Kenia Alfaro of Somerville’s Welcome Project, and Diana Giron of Harvard College’s Office of Diversity Education & Support — said helping students of all immigration statuses fulfill their potential is not without its challenges, but universities are in a unique position to advocate for students and their families. Gonzales recalled a student at Princeton University who had an opportunity for a fellowship abroad after graduation. Like Park, it was unclear if he’d be able to come home if he left the college and the country. But the university responded by finding a job for the student, so he could gain a visa and come back to the U.S. Universities need to bring that dedication and ingenuity to help more of their students, Gonzales said.